Notes: Lemon drops, vanilla bean, tangerine and juicy peaches. Notes: Top notes of raspberry, strawberry, fig leaves, and bergamot; middle note of sandalwood and bottom notes of honey and baby powder. Description: Light, fresh and airy. Notes: Juicy blackberries, sweet black tea and wildflower honey. Description: A fruity and sweet tea inspired fragrance with a touch of sage to add an earthy aroma. Notes: Top notes of bourbon, pecan and cocoa followed by middle notes of cherry and bottom notes of vanilla and musk. Description: Strong and long lasting. Notes: Cake dough, toasted almonds, vanilla extract, sweet butter and drizzle chocolate. Description: A divine and subtle aroma of sweet buttery and almond notes. She is that pleasant next door neighbor of yours who offers you a nice hot cup of tea and conversation. This scent carries top notes of white tea, bergamot, yuzu and ginger; followed by middle notes of earl gray tea, and nutmeg; finished off with bottom notes of musk, woods and berries. Imagine grandpa in his recliner smoking a cigar, that is what this scent will remind you of. This classic blend starts with top notes of mandarin orange and amber; middle notes include rose, and honey; base notes are caramel, musk and hints of smooth pipe tobacco. This is a lovely unisex scent that will be enjoyed by men and women. Enjoy this truly twisted unisex perfume oil of leather, chocolate, vanilla, amber and musk thoughtfully blended into a warm, sweet and musky fragrance. Typsy Gypsy is made up of the all time favorite Absinthe drink, also referred to as “The Green Fairy,” an anise-flavored, highly alcoholic beverage derived from the distillation of a combination of herbs and wormwood. Unlike the real thing this fragrance will not leave you feeling tipsy. Notes: Amber, vanilla, sandalwood and musk. Description: A warm, sultry and sophisticated fragrance that can be layered with other scents to add complexity. Adding a touch of floral fragrance combined with the vanilla amber give an alluring aroma. Description: A blend of sweet peppermint and vanilla. Notes: French vanilla, wood smoke and soft lavender. Description: Sweet, woodsy with a touch of flora; complex and captivating. Notes: Sweet sugar, warm musk, jasmine and lilac. Description: A soft delicate, floral and mildly sweet fragrance with a hint of musk. 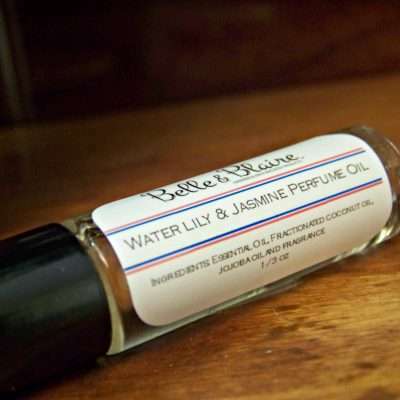 This perfume oil is a unique combination of fresh water lilies and jasmine with citrus notes of tangerine and orange is a refreshing, crisp and energetic aromatic fragrance. Just like a gorgeous wedding cake. This fragrance is laced with notes of white cake, buttery almond, Madagascar vanilla and creamy icing. Let the celebration begin folks! Description: A distinct floral fragrance that relaxes the mind.